I mentioned in my Travel Makeup Bag post that I recently became the proud owner of a By Terry Ombre Blackstar eyeshadow stick. Whenever I find a brand that I didn't know was available in the US and had only heard UK bloggers rave about, I just have to try something (see my Current Skincare Loves post where I felt the need to pick up both the Peptabright and Hydraluron serums from Indeed Labs). 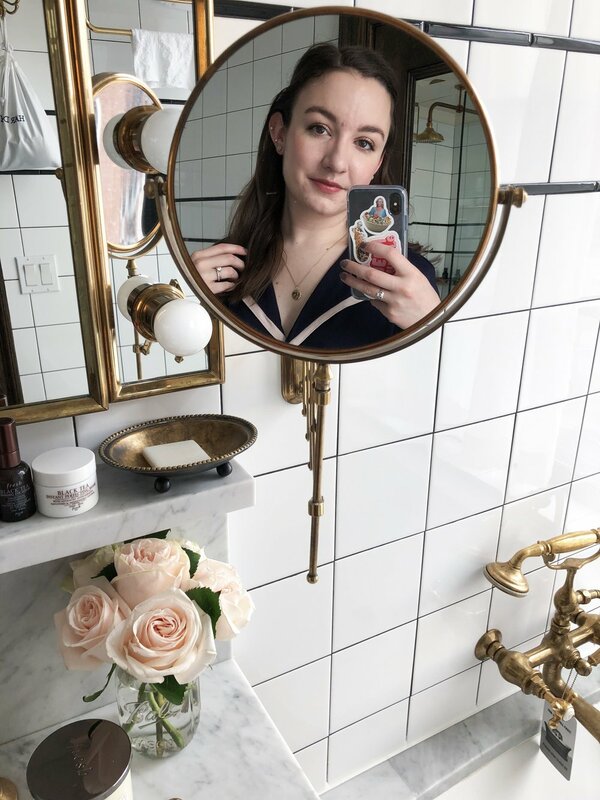 Everything at the By Terry counter I stumbled upon in Barneys New York looked so beautiful that I had a hard time picking one product, but in the end I went with the eyeshadow stick because I thought I'd get the most use out of it. Now, let me start by saying that this line is incredibly expensive (as in this product was $43, a lip balm is $60, and foundation is $115). But judging by the quality of the one product I have, I think the line might just be worth every penny. This is one of the most versatile eye products I own. I can apply it all over the lid or as a liner, in the crease for some added oomph, built up to a rich color or sheered out. It applies like a dream as well. For cream eyeshadows I'm used to the Maybelline Color Tattoos which feel quite thick and dry, so I was so surprised to feel how creamy and almost wet this felt. It's so easy to blend out - literally just one swipe with a finger and you have a perfectly diffused wash of color. And once it sets, it's there all day. I have the problem of while having super dry skin, I still get very oily eyelids and every eyeshadow will crease on me without a primer (and sometimes with primer, too). I had heard that these wouldn't budge all day, so I decided to put it to the test, and the first time I tried it I did not use a primer. When I felt that creamy consistency I mentioned earlier, I felt that things would not fare well for me. But I was absolutely amazed that at the end of the day, my eyeshadow looked exactly the same as when I had applied it in the morning. This has become my ultimate running late product because it literally takes me 5 seconds to swipe on and blend out, and I know it'll be there all day. I should probably mention that the color I got is Misty Rock. It's the most beautiful blend of purple/gray/bronze/brown/taupe with maybe some red thrown in, too. Since it has so many facets and tones to it, it would look beautiful on any eye color. The purple and reddish tones in it really call attention to my brown eyes, but there's a flattering color for any eye color mixed in there. I've worn this almost every day since buying it, and I've already added the colors Bronze Moon and Brown Perfection to my Christmas list! Have you tried an Ombre Blackstar before? What did you think?